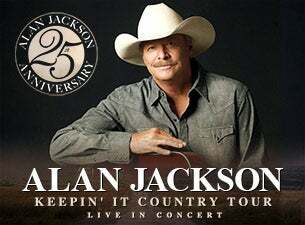 Alan Jackson returned to Augusta, GA at the James Brown Arena on Friday night. This would be his only stop in his home state of Georgia for the Keepin’ It Country Tour to celebrate 25 years of music. The fans in the sold-out arena were ready to get down to the country music of the legendary Jackson. The towering Jackson had an immense presence onstage all night long. He would strum a few chords on his acoustic guitar and then go slapping hands with the fans in the pit area during the instrumental portions of each song. Jackson also threw some rolled up t-shirts into the crowd during breaks in-between songs. Jackson soldiered on with more massive hits like “Summertime Blues” and “Small Town Southern Man.” His classic music videos played in the background on the projector screen for most of the songs. It was a fitting touch since Jackson was (and still is) a trendsetter in making memorable country music videos. Before select songs, The Strayhorns – the backing band – would take turn soloing on their respective instruments. They took position at the front edge of the stage for a more intimate, acoustic set. They started with “Here In The Real World,” Jackson’s first hit from 1990. Jackson then premiered a new song that he compared to early rockabilly called “You Never Know.” It had an fast tempo with fun lyrics. Jackson said his new album should be out in a couple of months. During this unplugged set, acoustic guitarist and South Carolina native Monty Lane Allen played the part of Zac Brown by donning the same type of beanie that Brown wears for “As She’s Walking Away.” Jackson and Allen blended their vocals just like the original recording. Something very unique happened during “Where I Come From”– the projector screen showed localized video (shot that day) of area landmarks around Augusta. This was a very neat concept because the road crew took the time to film before the show. Hopefully more concerts partake in this innovation. Jackson and The Strayhorns left the stage. After a few minutes, they came back out and played “Mercury Blues” and “Dixie Highway.” Jackson then rode off into the sunset as the crowd gave him a standing ovation. It’s amazing how many hit songs are in Jackson’s catalog. Most musicians work their entire lives and never have a hit, while talents like Jackson can make hits all day long. He is a true talent in this industry. He has stuck with the traditional country sound and never strayed away – this is why his fan base is so large. Jackson continues to have his finger on the pulse of the traditional country fan. The hometown Georgia boy seemed very comfortable in Augusta.